If you're looking for a dish that's as easy as it is romantic, look no further. 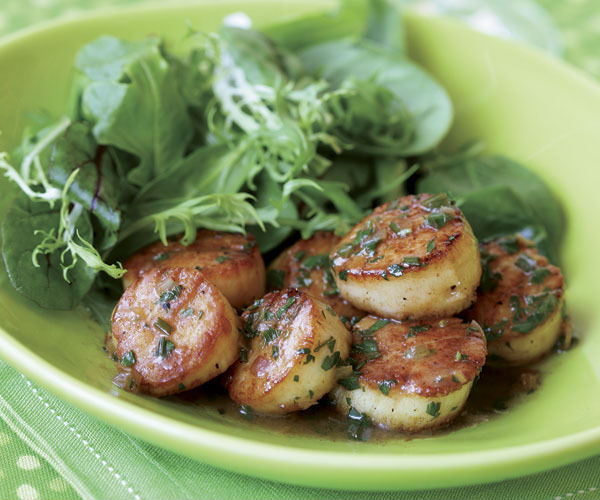 Seared scallops are quick-cooking, sweet, tender, mild, and delectable. TIP: Be sure to have all your ingredients prepped for the sauce (shallots diced, herbs chopped) before you begin searing the scallops. Return the pan to medium heat. Add a piece of the butter (1/2 Tbs.) and the shallots and sauté until the shallots begin to soften, about 1 minute. Add the wine and simmer until reduced by about half, another 1 to 2 minutes. Add the herbs and lemon zest. Reduce the heat to low, add the remaining butter, and whisk constantly until the butter melts into the sauce. Return the scallops and any accumulated juices to the pan. Gently roll the scallops in the sauce to warm them through. Taste for salt and pepper and serve immediately with lemon wedges on the side to squeeze over the scallops.